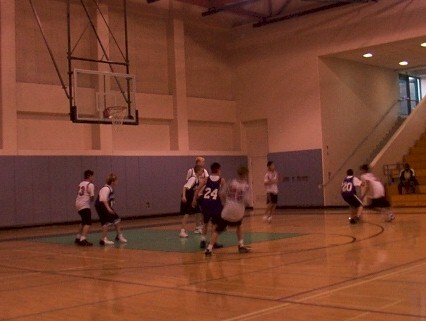 Here's Scott (in black, under the hoop) playing for the Mesa Verde Eagles 7th grade team. He made the first team in basketball and in volleyball this year. The volleyball team won the middle school championship. This team didn't do quite that well. Today they lost 59-30 to a team with a kid who was six feet tall. Scott plays forward is guarding the opponent's best player in this photo.